A-Class is available in 4 different colors - White, Silver Metallic, Mountain Grey and Jupiter Red. Watch latest video reviews of Mercedes-Benz A-Class to know about its interiors, exteriors, performance, mileage and more. The smallest in the overall lineup of Mercedes-Benz globally, the A-Class is serving its purpose as the only hatchback as well as the most affordable model from Mercedes Benz in the UAE. One of the most stylish and futuristic looking hatchbacks of recent times, the A-Class doesn’t fall short in terms of luxury and sheer performance, thus staying true to its parent company’s ethos. In the UAE, the Mercedes Benz A-Class is being offered in two different variants. Unlike the exterior which has seen just mild revisions, the interior cabin has got a complete revamp. The dashboard is all-new and seeks inspiration from the new generation sedans from Mercedes-Benz. While the three-spoke steering wheel is the same as before, the instrument console behind it is an all-new unit. It is the same 12.1-inch full TFT screen as seen in other new models from Mercedes- Benz, which also integrates the very futuristic looking infotainment screen in it. Below the long, horizontally laid screen for the instrument console as well as infotainment screen, the round propeller like AC vents are placed. The climate control gets toggle like switches, and in total, this cockpit surely looks like as if it is borrowed from a fighter jet. The cabin feels solidly built and maintains the premium appeal of the other Mercedes-Benz models, despite its entry-level positioning. However, what it falls short on is the amount of space on offer – the rear seat space is just cramped with limited knee room and headroom. In terms of stance, the Mercedes Benz A-Class score full marks for its athletic and sporty design. In this latest iteration, Mercedes Benz has followed a dramatic new design language which was introduced in the CLS saloon first. At the front, the A-Class still gets the same scooped front grille with chrome inserts, although the edges are more rounded this time. The headlamps are all new units – they are sleeker with an upswept design and get new LED headlights as well as new design for the daytime running lights. The A-Class, when viewed from the sides, looks a bit lower than before, which makes its stance even sportier. The side profile hasn’t changed much in the process of the facelift, with a curvy design for the doors and rear pillar and the door mounted rear view mirrors. However, as expected, the new A-Class gets a new set of alloy wheels. At the rear too, the new A-Class gets a newly revamped set of tail lights – they are still full LED units, but pointier towards the inner edges. Apart from that, the A-Class retains the sloping design for the rear windscreen as well as a roof spoiler. Matching the sporty personality of the A-Class’s styling and engines is the overall driving dynamics. The A-Class gets a very sporty suspension setup, which along with the low slung stance of the car, gives it dynamic agility. Helping the matters are big-sized 17-inch alloy wheels, which do offer tremendous grip levels. One also gets a host of suspension modes on offer – individual, sport, comfort, and eco, to set the driving experience as per one’s choice. Mercedes-Benz has employed its smallest set of engines for the A-Class, which is quite evident given its small size. The A-Class gets two variant options here in the UAE – A200 and A250. The A200 comes with a 1.3-litre four-cylinder petrol engine under its hood, which produces 120 PS of power and 250 Nm of torque. On the other hand, the bigger A250 has a 1.9-litre four-cylinder engine, which generates 165 PS of power and 350 Nm of torque. A 7-speed automatic transmission is common to both the engines. Despite its small size, the Mercedes-Benz A-Class is packed with safety features, the list of which includes six airbags, ABS with EBD and Brake Assist, Lane Departure Warning, Forward Collision Warning, cornering brake control, dynamic traction control and hill start assist. The Mercedes-Benz A-Class might be small in dimensions and has an entry-level price positioning, but that doesn’t deter it from the fact that it is every bit a luxury car. While the overall styling, performance and driving appeal feels sporty, the interiors have that uber-cool and luxurious feel. 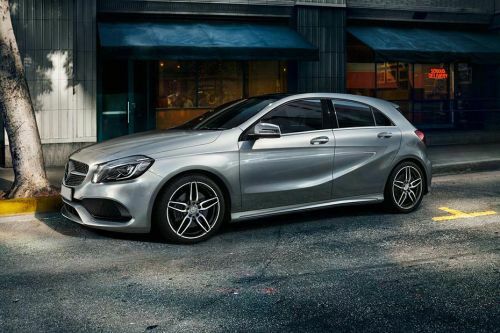 The A-Class, in every essence, justifies the three-pointed star badge on it. What are the colors options available in Mercedes-Benz A-Class?